With the introduction of Green New Deal resolutions in the House and Senate, sponsored by Representative Alexandria Ocasio-Cortez and Senator Ed Markey, Dogwood Alliance is encouraged to see Congressional allies, organizations, and a vibrant grassroots movement uniting behind a vision for a new economy that responds to the climate crisis, values life, and seeks to put social justice at the heart of climate legislation. The Green New Deal rightly calls for urgent action, which communities on the frontlines of climate change have been demanding for decades. Dogwood Alliance supports the immediate transition of the U.S. economy from fossil fuels to clean, renewable energy sources that includes a jobs program that puts justice first. The Green New Deal resolution also highlights the importance of investing in our natural carbon sinks, which are vital for carbon storage and climate resiliency, such as through “restoration and protection of threatened, endangered, and fragile ecosystems.” This is supported by the most recent IPCC report, which clearly lays out the need to draw carbon out of the atmosphere by dramatically scaling up forest protection and restoration, alongside drastically reducing greenhouse gas emissions across all sectors. As an organization on the leading edge of forest protection in our country’s most heavily logged region – the Southern U.S., Dogwood Alliance looks forward to working with the sponsors to actualize the imperative of protecting the best tool we have to sequester carbon emissions: standing forests. 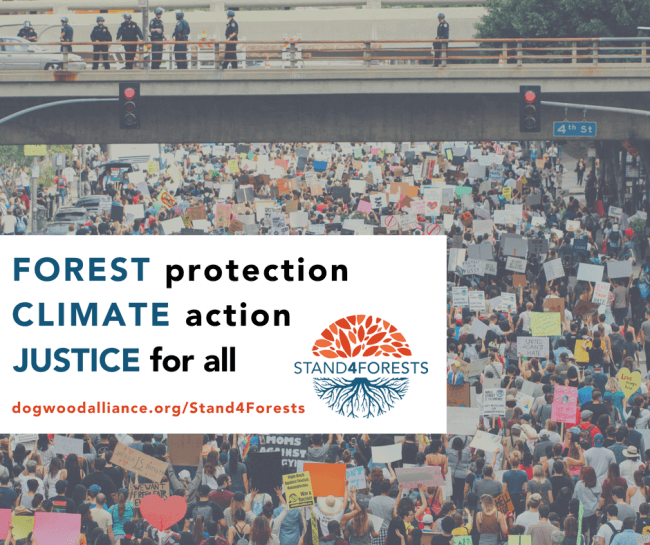 This message is affirmed by the over 200 elected officials, scientists, and environmental and justice organizations who endorsed the Stand4Forests platform last year, which highlighted U.S. forests’ essential role in solving the climate crisis and rang the alarm bell against false solutions to the climate crisis like burning wood pellet biomass for electricity. The industrialization of forests in the US has degraded biodiversity, natural flood control, critical life-supporting services that forests provide, and most importantly, are the best carbon sinks we have. We look forward to working together to strengthen the Green New Deal in order to make sure that protection of natural ecosystems like forests are prioritized in order to store carbon, reduce greenhouse gas emissions from the logging industry, and to prevent false solutions like more tree plantations and burning forests for fuel. Today’s resolution is an exciting starting point that marks how far the climate justice movement has come, and Dogwood Alliance is committed to work with partners, elected officials, and the public to make just climate action a reality. Protect our forests so they can protect our world!